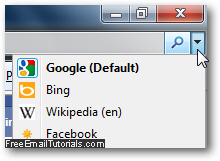 Internet Explorer 8 and Internet Explorer 7 introduced the "search box", which allows you to search using one of several search engines you can add to the web browser, without having to actually go to the website in question to enter a query from their search box. In this tutorial, we will show you how to add Facebook account search to Internet Explorer, in just a few clicks, which will allow you to search on Facebook right from a web browser window, regardless of the website you happen to have loaded in front of you! First, open Internet Explorer and go to www.facebook.com (but any page on Facebook that includes a search box in the top right corner should do). From this point on, if you perform a search from the Internet Explorer search box itself, a page of results will load, and show all results found on Facebook for the query you typed (like a Facebook user's name). This is all you need to do to add Facebook search to Internet Explorer - the downside of this approach is that Internet Explorer only remembers this search setting "temporarily" - in other words, when you close and restart your web browser later on, it will have forgotten" Facebook in the search providers dropdown menu - all you need to do, which we'll show in the next section, is to install Facebook as a search provider, or even make Facebook the default search in Internet Explorer 8 or IE 7. 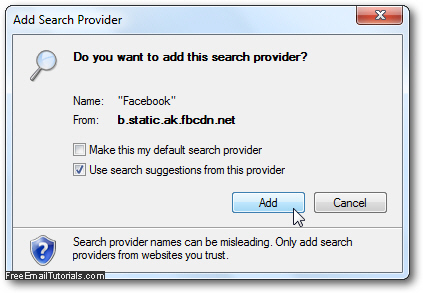 When you are inside Facebook.com and Internet Explorer has detected Facebook as a valid search provider, click on the "Search Providers" dropdown menu and choose "Add Search Providers", and click on "Facebook". 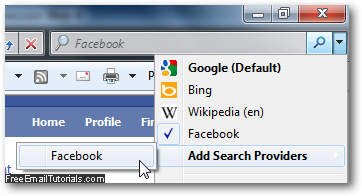 If you want to make Facebook search the default search engine in Internet Explorer, check the "Make this my default search provider" checkbox (you can also later on set Facebook as default search in Internet Explorer). Otherwise, you'll simply need to select "Facebook" from the dropdown menu when you want to make a Facebook search! Click on the Add button, and Facebook search is now part of Internet Explorer!